The next World Zionist Congress election will take place from Tuesday January 21, 2020 to Wednesday March 11, 2020. ZOA will provide information here as to how to vote when this information becomes available. We and the Zionist cause will need – and will very much appreciate – your votes in the early 2020 election! Please also contact [email protected] if you are interested in being a ZOA delegate-candidate in the 2020 election, or if your organization would like to join our slate. Incredibly, some of our opponents in the election support boycotts against Israel, and education that defames Israel. Many competing slates oppose the law recognizing Israel as the nation-state of the Jewish people. We cannot let the World Zionist Congress become the anti-Zionist Congress! Also, hundreds of millions of communal dollars are at stake. Some competing slates want these funds to be given to their own organizations’ pet projects. With the frightening increase in antisemitism around the world, this is not the time for personal sectorial interests. ZOA calls for communal funds to be used to assure the safety and security of the entire Jewish people: especially focusing on combatting antisemitism and assuring Aliyah to rescue Jews from countries where Jews are no longer safe. “[S]ome have called on world Jewry to vote for sectorial slates in the hope that they will then back projects aimed at their base. Supporters of the Zionist Organization of America (ZOA) have come forward with a different message: Jews throughout the world should vote in the World Zionist Congress elections for a slate that has the best interests of all Zionists at heart. . . . A vote for ZOA is a vote against BDS, a vote against anti-Semitism, a vote against a Hamas-Fatah unity government. It is a vote for safety, security, freedom and Zionism. “ZIONISTS: STAND UP AND BE COUNTED IN WZC VOTE: A vote for ZOA is a vote against BDS,” by Bobby Brown, Former adviser on Diaspora affairs to Prime Minister Benjamin Netanyahu, The Jerusalem Post. Thank you to everyone who voted for “The Zionist Organization of America/ZOA: Defend Jews & Israeli Rights” slate in the 2015 World Zionist Congress election. Your vote helped us promote pro-Israel activities, pass an important anti-BDS resolution (see “World Zionist Congress of WZO Adopts ZOA’s Anti-BDS Resolution including Judea/Samaria,” Nov. 2016), pass other pro-Israel resolutions at the 2015 World Zionist Congress, and helped us stop anti-Israel actions and resolutions. Please Help Ensure the Security of Israel & Jews All Over the World! Please Vote for The Zionist Organization of America/ZOA: Defend Jews & Israeli Rights Slate In the Upcoming World Zionist Congress Elections. The Zionist Organization of America (ZOA) needs your help to assure the security of Israel and Jews around the world, in an important upcoming election. What Is the World Zionist Congress? Once every five years, the World Zionist Congress meets in Jerusalem to make key funding and policy decisions that affect the future of Israel and Jews throughout the world. The 38th World Zionist Congress will meet in October 2020. The Congress’ 525 delegates from all over the world will include 145 delegates from the United States, elected from various competing slates. The Zionist Organization of America/ZOA: Defend Jews & Israeli Rights slate is running in this election and needs your vote to assure a strong Israel and for all the reasons listed here. Early register is expected to start on or before July 1, 2019. If you register early, you will receive a notice when the actual voting starts on Tuesday January 21, 2020. Please remember to vote for the Zionist Organization of America/ZOA: Defend Jews & Israel’s Rights slate when the voting starts!! Every Jew over age 18 is entitled to vote for the slate of his or her choice, in an election administered by the American Zionist Movement (AZM). To finance the election, the AZM charges a small fee. Last time, the fee was $5 for persons under age 30, and $10 for those over age 30. (In Herzl’s time, the fee was one shekel.) For the price of a latte or two, you can help Jews around the world immensely. Note: You do NOT need to be a member of the ZOA to vote for the “Zionist Organization of America/ZOA: Defend Jews & Israel’s Rights” slate. Many other organizations and their members, and people from every stream of Judaism, and many unaffiliated folks, all support the ZOA slate. In the most recent election, our slate included top officials from ZOA, Stand With Us, NORPAC, Sephardic Community Alliance, One Israel Fund, Israel Bonds, JCCWatch, Americans for a Safe Israel (AFSI), Eye on the UN, Americans for Peace & Tolerance (pro-Israel film producers); CAMERA, as well as prominent physicians, Rabbis, lawyers, public officials and Jewish activists. Why Is It So Important to Vote for the Zionist Organization of America/ZOA: Defend Jews & Israeli Rights slate? A strong ZOA slate will work to make sure that that the Jewish Agency has the priorities and resources needed to rescue and assist Jews all over the world who are in grave danger due to rising worldwide anti-Semitism. This is an absolutely critical life-saving priority now. Israeli Prime Minister Benjamin Netanyahu stated: “ZOA is a bulwark in the defense of Israel.” The Zionist Organization of America/ZOA: Defend Jews & Israeli Rights slate is the slate that exposes the truth about the Arab war against Israel, and that the Arab Palestinians’ real goal is the destruction of Israel. The previous World Zionist Congress included delegates pushing for radical “blame Israel” policies that deny these truths and weaken Israel. A strong Zionist Organization of America/ZOA: Defend Jews & Israeli Rightsslate is needed to make sure that the policies adopted at the Congress reflect reality. Other organizations that are running in the WZC election have very different priorities. One competing organization even openly promotes Boycotts, Divestment and Sanctions (BDS) against Israeli Jewish businesses in Jerusalem and other traditional Jewish areas right on its website! BDS is a movement to destroy Israel economically and delegitimize Israel and Jews throughout the world. Other slates do not prioritize or mention the teaching of Zionist history and Judaism in schools. Other slates favor unilateral land concessions. These other slates are going “all out” to obtain as many votes as they can, so that they can take over the WZC and vote for their dangerous policies. The World Zionist Congress makes policy, funding and leadership decisions for our main national institutions: The Jewish Agency for Israel (JAFI), The World Zionist Organization (WZO), The Jewish National Fund (JNF), and Keren Hayesod. A strong Zionist Organization of America/ZOA: Defend Jews & Israeli Rightsslate will help us make these institutions’ policies favor a strong secure Israel, the rescue of endangered Jews, and Zionist and Jewish education. 6. TheZionist Organization of America/ZOA: Defend Jews & Israeli Rights slate includes America’s leading Jewish activists from the ZOA and an impressive list of other organizations (see next paragraph)! This is the slate that will fight to defend Jews and Israel’s rights! Please contact [email protected] if you would like to be a delegate-candidate on the 2020 Zionist Organization of America/ZOA: Defend Jews & Israeli Rights slate. The most recent Zionist Organization of America/ZOA: Defend Jews & Israeli Rights slate included America’s leading Jewish activists, including top officers of the Zionist Organization of America (ZOA), Stand With Us, NORPAC, Sephardic Community Alliance, One Israel Fund, Israel Bonds, JCCWatch, Americans for a Safe Israel (AFSI), Eye on the UN, Americans for Peace & Tolerance (pro-Israel film producers); CAMERA activists; Award-winning author of “The New Anti-Semitism” Phyllis Chesler; a fmr. U.S. Congressman; Student leaders from many universities; prominent Rabbis, physicians and attorneys; and more! 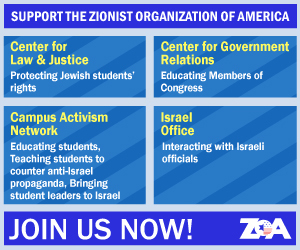 The Zionist Organization of America/ZOA: Defend Jews & Israeli Rights slate’s supporters and candidates include people from every stream of Judaism and every part of the Jewish community. ZOA supporters and members of our slate include people who are Orthodox, Conservative, Reform, unaffiliated, Russian-American, Persian-American, physicians, dentists, teachers, Jewish community activists, students, and much more. We hope you will join with us! Please Vote and Help Spread the Word! Voting for the next election will take place from Tuesday January 21, 2020 to Wednesday March 11, 2020. We will provide updates as to how to vote as soon as they are available. PLEASE VOTE for the Zionist Organization of America/ZOA: Defend Jews & Israeli Rights and spread the word to your friends and family to vote. If you have further questions, please contact [email protected] or [email protected].